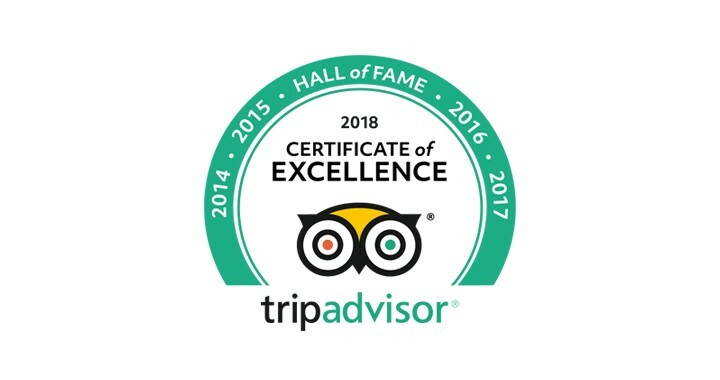 The China Guide was recently awarded TripAdvisor’s prestigious Certificate of Excellence for 2018, an accolade bestowed only on companies that meet a set of criteria based on ratings, reviews, and sustained success. And because this is the fifth year in a row we’ve received this honor, we’re excited to announce that we’ve been inducted into TripAdvisor’s Hall of Fame! It’s our clients and the memorable journeys we strive to create for them that make our job such a fun and rewarding one. We’d especially like to thank those of you who have taken the time to leave us reviews on TripAdvisor — your feedback means so much to other travelers and helps us to make sure that we’re continually improving our service. For us, being a Hall of Famer means we have a responsibility to continue going above and beyond to provide excellent and unbeatable service to our customers. We hope to do that and more, and we look forward to planning more extraordinary journeys and creating lasting memories with The China Guide’s global family for years to come!